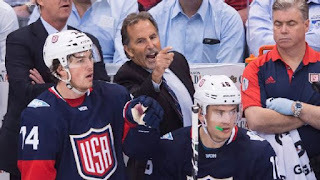 Tuesday saw the outcome everyone expected finally happen as Team USA was knocked out of the World Cup of Hockey while Finland was put on life support. Team Sweden, one of the favorites to win the World Cup of Hockey, took to the ice to face off against "younger brother" Team Finland at 3 o'clock and while little brother held their own for most of the match it was an unlikely hero that set little brother ahead for the win. With Henrik Lundqvist back in net for Sweden after missing the first game with illness, Team Sweden looked to have the upper hand. Lundqvist would prove to make a difference in a 2-0 victory. The go ahead goal scorer was Anton Stralman in slot, of all places. It wasn't until Loui Eriksson scored the empty netter with three seconds left that Sweden locked up the win. Finland isn't yet eliminated from play but it's certainly on its last legs, needing a lot of help to make their way to the next round. Secondarily, all Penguins in the game (Finland's Olli Maatta, Sweden's Patric Hornqvist and Carl Hagelin) were held scoreless. Most saw it coming early on, when the team was formed in an identity of being tough, physical, gritty instead of talented like every other team in the tournament. Indeed, Team USA played as they were built and lost as they were built. It was the expected outcome for all but those in charge. Despite scoring the first goal of the game, Team USA's lead lasted all of 90 seconds before Team Canada tied it up. From there Canada never looked back. At times looking like a cat toying with a mouse before killing it, they took a quick 4-1 lead that never seems threatened. Despite three posts in the third and a late goal, Team USA never looked in the same league as Team Canada. The same way they never looked in the same league as any team they played against in the prelims or tournament. A not so shocking failure for Team USA that represented a huge missed chance. On national TV on ESPN with a chance to show off all of their skill, and fun, of USA hockey and make new fans. Instead they chose to go boring, physical, skill-less hockey and were as such the first team knocked out of the tournament. Sidney Crosby let everyone else do the work for a change while Mike Sullivan looked for a way off of the sinking ship. Either Matt Murray or Josh Gibson will lead Team North America against Team Sweden at 3:00pm on ESPN on Wednesday. Later that night Team Canada (likely sans Crosby) will face off against Team Europe at 8:00pm, also on ESPN.